Some people's imagination is limitless as if the child in us never grew up! I sometimes think I am still a child , if only the mirror didn't tell me otherwise. When I was planning my trip to Houston for my 2nd wholesale show for Holly Hill Quilt Designs, I had picked out an aqua rug with cream swirls. But then found out at the last minute that the rug was defective and they didn't ship it. So here I am in CA getting ready to vend at Pacific International Quilt Festival and now I've got to go rug shopping. My sister and I and Polly went to store after store. Now of course, there is such a thing as "budget" to consider, but then there is also wanting to like the rug too. You'll see in the picture below that I found the most adorable chicken rug. And my sister found the lovely pink Christmas tree so we created a rather unique look from these items. If I told you I was going to have a chicken rug and a pink Christmas tree, would you have thought I'd gone off the deep end? But I think you'll agree it looks cute. ﻿And if you look close you'll see all of our quilts - we had so many new ones to show. Everyone really liked the snowman in the back corner - maybe because winter is fast approaching! There is a blog tour being done for the 100 Quilt Blocks by Top Designers and Nov. 12th is my "day". As an incentive for people to stop by and see what's going on here, I'm going to be giving away some of my patterns and the winner(s) will be randomly drawn. Comment on my blog any day between now and Nov. 25th and maybe you'll be the winner! Taking the blog tour - what a lovely display of quilts! Congrats on being featured in the "100 Blocks"! Wish you a good time there. And thanks for the give away. So great that you are also in the magazine 100 blocks! Look forward to seeing the magazine and viewing your block! Love the red tree and the chickens! Thanks so much for participating in this blog hop! Thanks for the chance to win your patterns. Am on the Blocks Blog Tour! I would love one of your patterns! Thanks for the chance to win! You're right, I wouldn't have thought to pair chickens with a pink tree; and, it does work! I think, after the fact, that the aqua and cream would have been too predictable. That is a cute pink Christmas tree! I want one! Beautiful booth and a lot of work!!! I absolutely love the rug and I really dont have chickens in my house except for the chicken pin cushion on top of my sewing machine that a friend made for me. And yes, your booth is beautiful. I would love to win a copy of the book. The booth is great. The tree is a perfect additon to all those lovely quilts. I really enjoy seeing the photos of the Houston market. I really like the snowman quilt too. I think he will be a hit. Thanks for participating in the 100 Quilt Blocks shop hop. Your booth looks amazing, love the chicken rug! What no picture of your block :( Guess I'll have to search the magazine for it, still hoping to win one. Enjoy your Thanksgiving. 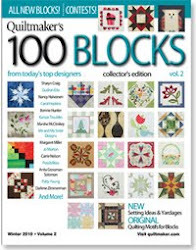 Congratulations on being in the Quiltmaker's Magazine. Can't wait to see your block in the magazine, I am sure it will be great. thanks for the giveaway. I was invited to Market by my local shop owner and when I saw your booth I think it was love at first site. All your quilts were lovely. My favorites were the two pumpkin quilts. Congratulations on being in 100 Blocks! I love your pink Christmas tree! Everyone needs a little color and style. Good Morning! Your booth looks wonderful, I love pink trees they're so kitschy. Have a great trip to your last show of the season (I love CA)and Happy Thanksgiving. Hope someone is helping with the cooking. I agree, the snowman quilt is cute. The pumpkin sorbet is nice too. Great display! Hope you have a successful trip. Pumpkin Sorbet would make a lovely table topper for my 42" round, dark wood table. Hi Mary Jane, What a beautiful booth display! I wish I could have gone to Houston.....the FaceBook pictures have kept me drooling!!! Thanks so much for the chance to win your giveaway!!! I don't know how all of you manage to keep your heads on straight and keep blogging with market and the 100 blocks and all the activity! Thanks for including us in your whirlwind! I like the pink tree! It is really unique, I've never seen one quite like it ;-> It would be fun to figure out how to decorate it! Please enter me into your drawing! Thanks! Nice to meet a new friend. Thanks for the view into your day. Nice to meet a new friend. Thanks for a view into your world. This is my first time on your blog - I look forward to checking out your quilt patterns! Can't wait to see some of your patterns. California bound are you? It's sunny here in San Diego so bring your sun glasses. I like the snowman quilt too. Yep who would think a rooster quilt and a pink Christmas tree would come together so nicely. I love this blog tour. I seen many many sites that'll I'll be returning to. I'm curious to see what block you created for the magazine! And I wish I could have been in your booth for a close-up look at your quilt designs! Instead, I am going to go take a look around here at your site! Thanks for the chance to win! I look forward to checking out your patterns. I hope you have a great time at your show! 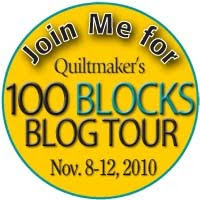 I'm having lots of fun with the Quiltmaker's 100 Blocks Tour - "meeting" lots of fascinating quilters. You created a beautiful booth with your last minute finds. The rug and tree are very eye-catching, and the quilts are gorgeous. Thanks for the giveaway. I like the photo of your boot and I like the snowman too! I agree, the pink xmas tree is a unique additon to your booth. Can't wait to see the block you've designed. Loved your booth at market. How can you go wrong with a pink Christmas tree? I mean, really. Cute, cute, cute! Thanks for the giveaway. I'd love to win it. I would love to win your giveaway! Have fun on your trip. Love the tablerunner with the stars...great colors and pattern! Wish I could have been there to see your booth. Thanks for the picture of it & for the chance to win. Your pink Christmas is really something. It takes me back to my youth when we used the revolving lights to shine on the tree. I like your quilts in the picture. I wish I could see them up close. Yes, the chicken rug and pink tree are just cute as can be! I was able to click on the photo for a closer look--lots of great stuff! Even though the snowman was a show favorite, I think the pumpkin one next to it is adorable! Congratulations on getting a blog set up. I'll be sure to be back to visit! Congratulations on your booth it's lovely. Actually I think the rug you chose is beautiful just love the chickens on it. I quite like Teddy Stevens Comes to America Summer wall hanging with the teddy in the cart and Christmas In My Heart Year-Round. Thanks for the chance to win some of your patterns. Enjoy your last show of the year. I love the picture of the quilts - i like the runner next to the snowman! And I LOVE the Chicken Rug ! Thanks for the lovely giveaway. I have loved the 100 quilt block tour. The chicken rug is so cute....love it! That is a very nice booth display, my favorite quilt is the wallhanging with the pumpkins. Am looking forward to the 100 Blocks coming out!! I have last year's. I was expecting a special post for the 12th to show us your block! I'm sure glad I stopped to read some of your posts, or I wouldn't have known that I could post here to be eligible for your giveaway :-D I subscribe to your shop's newsletter, but didn't realize you had a blog, too. By the way, I love the rug in your market booth. I think your rug looks really cute and the booth looks great. Snowmen patterns are one of the ones I am always drawn to. Your booth was lovely chicken, pink Christmas tree and all. Congratulations on being in Vol. II of Quiltmaker's 100 Blocks. It would be super to win that snowman pattern! I'd love to win your patterns. Congratulations on being in the 100 blocks book. I love the rug - and total look! Thanks for the giveaway! Your booth looked very cute. I like the Welcome Winter quilt with the snow globes and snow flakes (although I'm not anxious for the real thing, which is supposed to happen tonight.) And the table runner with the stars and the sweet green swags is darling! Happy Thanksgiving! May you long continue to explore your ideas and fantastical worlds. Your booth looks beautiful- Kudos to you and your sister for creating something so pretty. Thanks for the opportunity to win some nice prizes and for having a block in the magazine. Your quilts are beautiful. And the chicken rug is perfect. It's cool how things work out. Hmmm Its late friday and Im the first poster to comment? Odd. I like your display, the pink tree is awesome! Congratulations in getting your block included in this years' magazine. Good luck at the last show of the year. I bet you're looking forward to some down time from shows to relax and celebrate the holidays with your family. I don't see a post for Nov. 12 so I will comment here. Congrats on having a block in the magazine. Your booth looks great and I do like that chicken rug! Love your block and can't wait to see it in the magazine. Thanks for having this giveaway. Btw, loved your rug. It looks really nice in your booth. Congratulations on getting your block in the 100 Block magazine. I really enjoyed looking at your quilts. Your patterns are adorable. Congratulations on having our block featured in the magazine. Thanks for sharing your blog and retail website too.